The Elite Series Tables are 100% Hand-crafted, Custom Made from hand selected hard woods and Materials to best complement each other. Nothing is mass produced!!! We have taken our 20 some years in furniture making and turned it towards making one of a kind Magic Equipment. Each Table has its own characteristics that you will not find on any other Table, EVER!!!! We hand select hardwoods with that special character so that it will make your People turn their heads and take notice! Large Elite: 27" wide by 21" deep by 2.5" high. 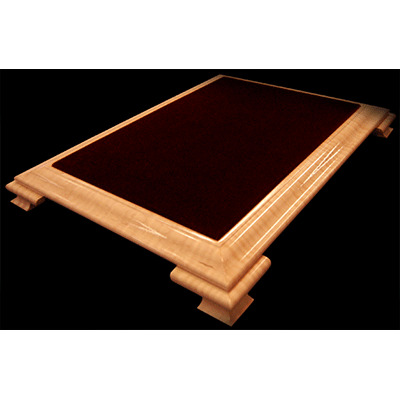 Colors: Pristine Maple with the Elegant Natural Color and Majestic Red color Fabric. This is a table that will stand the test of time, low to no maintenance and a lifetime of great looks! Each Elite Table Comes With Card And Coin Hold Outs. The Top Fabric Can Be steamed (Home Steamer) to freshen it up for your next show; the top fabric is also water proof so if you spill something on the fabric it will not soak into the substrate. When you need a Table to perform on, select one that will turn heads, Select The Elite Series!